Hey ma! Look What We Did The Other Night! 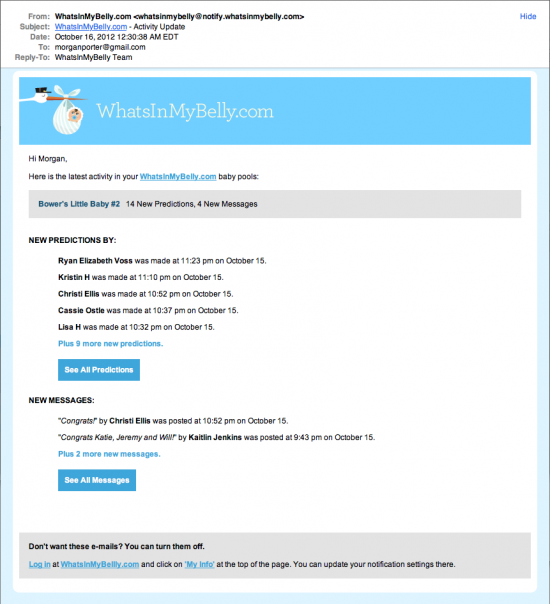 When you create a baby pool on WhatsInMyBelly.com, you will automatically get automated e-mail notifications about your baby pool, and so will any participants in your pool. This has been a part of the website since day 1. We don’t mean this as spam, we just want users to be able to get some kind of notification when there is activity in their pool. The default setting of these notifications were set to send all pool administrators and pool users an email if there was a new prediction or a new message in any pool they use. You could also turn these notification on and off at any time under the “My Info” link after you login. However, it quickly came to our attention that some people couldn’t find this setting (my fault for putting that setting under such a vague title – UI designers make mistakes too!) and if they were participants in a pool with a lot of predictions they were getting flooded with e-mails they didn’t want. We planned to tweak these e-mails to reduce the amount of notifications everyone received, but as of Monday, we still hadn’t gotten to it. Well, Monday evening The Bower Power hit us. Katie Bower of bowerpowerblog.com started her baby pool, we offered up a little prize money, and within a few hours we realized we had a bit of a problem on our hands. Baby Bower #2 pool had over 60 predictions in just a few hours. [As I'm editing this post to go live, it's pushing 300!] Apparently the combination of a super popular blog and a little prize equaled a lot of sudden traffic on our site. We decided to combine all the individual notifications into one daily notification e-mail that would summarize all the activity in a user’s pools. So, instead of getting tons of separate e-mails, the most you would receive is 1 e-mail per day, if there was activity to announce. So, for now, we think we have a better e-mail notification system but I’m sure we will have to make plenty more changes in the future. Ok, so calling the Bowers “friends” is a bit of a stretch… and by “stretch” I mean they probably read that and now consider me a stalker. I don’t personally know them, but like many of their readers, I consider them friends, particularly after what has happened in the past 24 hours. As I stated before, Katie started her baby pool on the website Monday night and mentioned it on her blog. Today, as people continued to make guesses for Katie and Jeremy’s baby, their traffic combined with a few other sources of traffic, and started to slow WhatsInMyBelly.com down. At one point on Tuesday morning, it wasn’t loading at all. Luckily, Daniel made some changes and had things running smoothly again within an hour. Monday night was a late night, and Tuesday kept us on our toes, but we’re thrilled with the response everyone has had to The Bowers Baby pool. We can’t wait to see photos of the baby, and see who comes out the winner in the largest pool we’ve ever hosted. A sincere thank you to ALL our website users. Thank you for using the website and thank you for being patient while we continue to improve how it works. And, of course, a huge thank you to Katie, Jeremy, Will and Baby Bower #2!! As you all know, this website is completely free for anyone in the world to use. We’ve spent a ton of time building it and tweaking it, and hope to make it even better. However, if we can’t successfully build up enough traffic to attract a few sponsors and advertisers, eventually this little side project will have to give way to “real” work. As someone who has been a freelance web designer for over 10 years, I’d love nothing more than to work full time on this website and other self-initiated projects. (Don’t get me wrong, I love client work, and I’m eternally grateful for every bit of work I’ve ever received but after 10 years of bringing other peoples’ ideas to life, I’ve really enjoyed making my own idea into a reality for once.) We’re still a LONG ways from making that a reality, but what we saw yesterday does give me some hope that maybe something could come of this little project. Thank you all for keeping my little dream a reality … at least a bit longer.